The Book of Revelation is a book for the times of the first century and had to have been written very early in the apostles’ ministry. It is probably one of the first New Testament books written rather than its last. Revelation 13 tells of a seven-headed beast with ten horns upon one of its heads; also one of its heads seemed to have incurred a deadly wound but this wound was healed. What does this mean? Neubchadnezzar – King of Babylon – who plundered and destroyed both the city and the Temple (2Chronicles 36:5-20), leveling everything to the ground in the month of Ab on the 10th day (Josephus: “Antiquities of the Jews;” Book X, chapter 8, paragraph 5). Pompey the Great (representing and later the leader of the Republic of Rome) fought very little and gained access to the Temple trough treachery, plundered it and took much from the treasury. He noted the devotion of the Jews to God and set up a priesthood friendly to Rome, thus taking away its (i.e. the priesthood’s) former dignity and gave it away for a price. – Josephus; “Antiquities of the Jews;” Book XIV, chapter 4, paragraphs 1 through 5. Herod the Great besieged Jerusalem and took it but did not allow the Temple to be plundered. Josephus; “Antiquities of the Jews;” Book XV, chapter 1, paragraphs 1 & 2; “Wars of the Jews;” Book I, chapter 18, paragraphs 1 through 3. Titus (general and son of the Emperor of Rome) took Jerusalem and though he tried to stop it, could not keep the soldiers from destroying the Temple on the 10th day of the month of Ab, 70 AD, two days after taking the lower city.—Josephus: “Wars of the Jews;” Book VI, chapter 4, paragraphs 1 through 8; & chapter x, paragraph 1. Jerusalem, the capital of Israel, was taken seven times in her history. These are the men who did it. They represent the seven nations of Egypt, Babylon, Grecian Egypt (King of the South), Grecian Syria (King of the North), the Republic of Rome, Edom, and the Empire of Rome. These heads or kings are gentile powers, but their importance to Scripture is that they ruled or had great influence over God’s people, the Jews. This means that the Beast, as such, was in power or animated only as long as the Jewish nation existed. 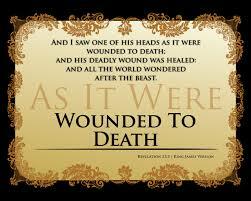 The book of Revelation shows that one of the seven heads had been given a deadly wound but that wound was healed. What this means is when Nebuchadnezzar destroyed the kingdom of Judah, Jerusalem, its capital and its Temple, in reality, the Beast no longer existed. The existence of the Beast is tied to the existence of the Jewish nation. If there is no Jewish nation, there can be no Beast. The Beast received a deadly wound to its second head when the Jewish nation was destroyed. The deadly would was healed when Cyrus permitted the Jews to return to their land under the leadership of Zerubbabel, the governor, and Joshua, the High Priest. The Beast through the Babylonian / Persian influence over the Jewish nation had returned to life. We find the same Beast in Revelation 17, and what seems significant there is the time that John is writing the book of Revelation. It is recorded that, concerning the seven heads, five are fallen one is and one is yet to come (Revelation 17:10). In other words, the one that “is” is alive and in power over Jerusalem at the time of John’s vision. What does this mean? If the above is correct concerning the identity of the heads of the Beast, shouldn’t six have fallen? We have the kings of Egypt, Babylon, Grecian Egypt, Grecian Syria, the Republic of Rome and Edom. That is six kings or kingdoms. Herod the Great died and with him Edom’s influence over the Jews. Well, this is true, but not exactly so. Three of Herod’s sons reigned over his kingdom, but Archelaus who reigned over Judea and Samaria was banished after reigning only a few years. Technically, Edom had no influence over Jerusalem after Archelaus was removed. This remained true until Herod’s grandson, King Agrippa I, was appointed king over Judea and Samaria in addition to the other lands he ruled. This made Agrippa ruler over virtually all of his grandfather’s territories. Therefore, it could be said anytime between 41-44 AD that five kings have fallen, one is (Herod / Agrippa), and one is yet to come. If the above understanding is correct, this means John wrote the book of Revelation during the reign of Herod Agrippa I over Judea and Jerusalem (41-44 AD). John was on the isle of Patmos either due to the persecution arising out of the execution of James, his brother, or simply for the purpose of preaching the word of God (Revelation 1:9), and while on Patmos John received the prophecy as recorded in the book of Revelation. John was then able to share this prophecy with the church in Palestine and throughout the world long before the Jewish war with Rome. Daniel 2 represents the fourth kingdom (Rome) with the two legs of the image. The two legs represent two different forms of government of the same nation or people. At first Rome was a republic, but it turned into an empirical state. Thus, it is represented by the two legs in Daniel 2 and two heads of the seven-headed beast of Revelation 13. This is silly. The sixth head couldn’t be Herod the Great! John said five had fallen and one IS. He said this decades after Herod the Great had died! Greetings ‘Con’ and thanks for your comment. You are correct in that Herod the Great was dead, but his dynasty was ‘healed’ in his grandson Agrippa the Great who killed James, the Apostle (see Acts 12). I am not of the group who will agree that the writer of Revelation didn’t write until the 90s or later. We have testimony from Clement of Alexandria that all of the New Testament was written between the reigns of Nero and Tiberius, which implies at least one book was written before Tiberius died cir. 36-37 CE. I strongly believe Paul referred to the book of Revelation in 2Corinthians 12 implying, not only that it was written by 57 CE (the writing of 2Corinthians), but that it was written well before that date–in time for copies to be sent to the gentile churches, including Corinth. Otherwise, Paul’s admonition in 2Corinthians 12, involving a man he knew who ascended to the third heaven, makes no sense. This would put the writing of the book at least a decade before Paul’s two Corinthian letters. If we consider the context of Revelation, itself, we could put the writing during Agrippa’s reign. Prove me wrong. Lord bless you as you look into his word for truth. I do NOT hold your point of view. Since your video quoted only Scripture, I’ll post your point of view here, but know this, nearly all of Western Christendom trace our roots through the Roman Catholic Church to Jesus. If what we have come out of is rotten, what does that make those who came out of her? Yours is an interpretation that doesn’t make sense unless there are so few to be saved that it renders God’s power weak against that of the world. I don’t agree with many teachings of the Roman Catholics, but I consider them my brethren. We are not united with doctrine, but by the Holy Spirit who works within us all. It is his responsibility to drive out error, both in me and within the greatest of churches. I judge no one; I look for mercy both for me and all others.